Fantastic! I'm thinking about writing a passive aggressive note to my neighbours instructing them on how to take out the trash properly. This probably won't do anything, but I think it might make me feel better. 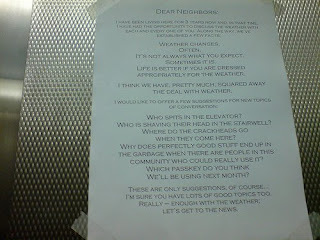 Well, if you do, please submit the letter to the Passive aggressive notes website! Alas, sad day for the Buckfast fiends. Did you catch the article the other day about them building a new distillery for Buckfast?